"Soon after, the London Daily Telegraph revealed that computer hackers had broken the security code of the PLO's computer system, uncovering records of about $8 billion the PLO held in numbered bank accounts in New York, Geneva, and Zurich, and smaller secret accounts in North Africa, Europe, and Asia. The newspaper also unearthed further secret holdings of the PLO - including front companies, European real estate, and shares in Mercedes-Benz and the national airlines of the Maldives and Guinea-Bissau - totaling about $50 billion for the year 2000 (up from $32 billion recorded in 1998). Naturally, (PLO Chairman Yasser) Arafat and his men denied the report". 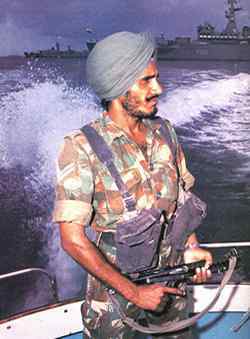 Rifle M-16 (all models) for use in the SPG- the Special Protection Group previously called the "Delta Force"
NSS under the protection of Shri Big Daddy-ji. "Indian Ocean" took on a new meaning when the NSS Commander-in-Chief pleaded with India for help. 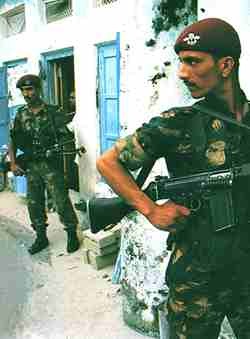 Indian troops were deployed in Malè following a failed coup attempt in November 1988. Above left: a turbaned corporal and Indian warships in Malè harbour. 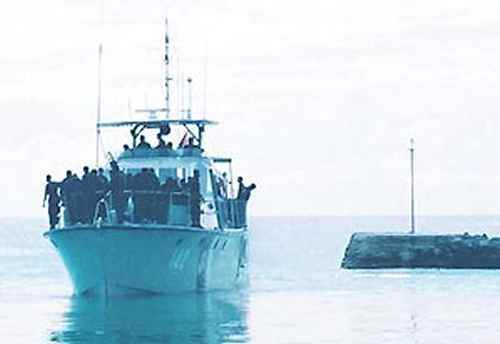 With "swords drawn and bayonettes fixed", the Dharma Chakra flies at full mast in the Maldives. Above right: With the full consent of Maldive authorities, armed Indian troops entering and searching Malè homes as they would in Sikkim, Arunachal Pradesh or Kashmir. This was the third time in 500 years that the armed forces of a government based in India was deployed in Malè. The first was in AD 1573 when Kateeb Mohamed Thakurufan of Utheem signed away sovereign control of the Maldives to the Ali Raja of Cannanore in order to dislodge Andiri Andirin, Regent to King Siri Dhirikusa Loka. The second was when the Ali Raja attempted to re-assert this control about 200 years later by capturing Malè and abducting the King Siri Navaranna Keerithi. Those who subscribe to the notion of a "Greater India" may be looking forward to a day when "Divehi Raajje" may become "Dweepa Pradesh". A permanent militia force was first established in the Maldives late in the Sixteenth Century. By the late Nineteenth Century there were several units of land and naval forces. Land militiamen were called hangun and naval militiamen were called kalaaseen. During the reign of King-Sultan Ibrahim Nooreddine Iskander a number of younger members of the gentry in Malè were taught the traditional martial arts. This took place in the king's private residence Aaganduvaru, immediately to the south of the Etherekoilu complex. The most prominent among them were Athireegey Ahmed Didi, Galolhugey Mohamed Didi, Roanugey Ibrahim Didi, Roanugey Mohamed Didi, Don Manikuge Ismail Didi, Don Manikuge Abdulla Didi, Kalhiharugey Mohamed Didi and Kalhiharugey Ahmed Didi. The instruction took place in the evenings under the direct supervision of the king. One evening when the king arrived a number of the young men, under the guidance of Don Manikuge Ismail Didi were doing foot drill. Ismail Didi had attended an English school in Galle in Ceylon in the 1870's and had been in a cadet corps. The king approved of the foot drill and asked Ismail Didi to train the young men in the Western military style. Light firearms were issued to the squad which was soon constituted as a separate arm of the militia. The unit was called Sifain. 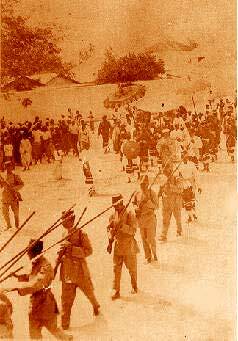 The Sifain first took part in a public ceremony on 20 April 1892 when they formed part of the king's procession during the hithi festivities in the latter part of Ramadan. The Malè public had mixed feelings about the new militia. The older units of hangun and kalaaseen felt envious. It was rumoured that the new Sifain were so brave that they would not be scared of anything. This was put to the test on the first evening of the festivities. As the Sultan's procession turned west from Kembualhaa Magu (Sosun Magu) to Meduziyaaraiy Magu a nobleman by the name of Malin Manippulu son of Noomaraaganduvaru Faarhanaa Kilegefan held a lighted firework over the head of a Sifain militiamen until he was scorched. The militiaman, Private Roanugey Ibrahim Didi lived up to expectation, but collapsed at the end of the procession and died 16 days later. The first commanding officer of the Sifain was Don Manikuge Ismail Didi. Sifain was derived from the Ottoman Turkish term Sipahi. Sipahi were feudal cavalrymen in the Ottoman Empire which represented the most important providers for the Ottoman army until the middle of the 16th century. A sipahi was a person who had been granted with a fief, called timar, ziamet or hass. Until the end of the reign of King-Sultan Ibrahim Nooreddine Iskander the Sifain remained the preserve of the gentry. The first commoners to be admitted to the Sifain were Loageji Ganduvaru Medu Tuttu, Tuttu Futhu and Addoogey Adam Maniku. Until 1932 all government entities in the Maldives had Dhivehi names. In a drive to Islamise, many of these were changed to Arabic names. 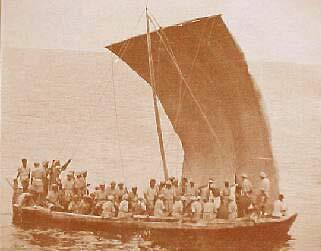 The Sifain survived in the Dhivehi form. In 1968, the Arabic was seen as anachronistic and government entities were given English names. Sifain escaped this transformation too. In 1970 someone noticed this anomaly and the Sifain were given a more "civilised" name, the National Security Guard (NSG). The headquarters of the Sifain had been called Sifainge. The Sifainge sign was soon unceremoniously hauled down and the following sign installed. This reads "Neysanal Sekiyuritee Gaadunge Depoa". This proved to be rather unfortunate. Maldivians had difficulty pronouncing the consonant p when it was placed in certain syllables. The p of the depot was pronounced as an f, with rather embarrasing results in Dhivehi. Consequently, the depot sign was hauled down more unceremoniously than the Sifainge sign. Once more the Sifain was renamed, and in a hurry, to nip any lasting stigma in the bud. Thus the National Security Service (NSS) and its Headquarters came into being. Until about the late 1950's the Sifain undertook only a ceremonial military role. Since then the Sifain have taken on many other duties. Today the National Security Service is the paramilitary police, defence, presidential bodyguard, immigration and emigration documentation, border control, intelligence, espionage and civil defence organ of the Maldives regime. The officers of the National Security Service. The officer wearing the ceremonial sword is General Maumoon Abdul Gayoom, the most decorated soldier in the history of the NSS. The following is an extract from a recent article on the Internet: [This link may not load when you come in through certain servers. Please do not adjust your machine. It is not a technical problem in the site. Query your ISP] "According to the Amnesty International Reports from 1992-2001, the National Security Service of the Maldives continues to detain several prisoners of conscience and possible prisoners of conscience and conditions of detention amounted to cruel, inhuman and degrading treatment. The National Security Service has an open warrant, as a matter of practice, for arrest, search and seizure and to censor, intercept, read, listen or to divulge all forms of private communications among the members of the public, including letters, messages, telephone conversations, electronic mail, data and so on". Click here to see a related story in another site.